Even beginners can cut decals, POP displays, signs, labels, stencils and evenpin striping for vehicles. Lightweight, compact design that handles vinyl, paint mask, reflective vinyl, twill, heat transfer, and etching material. 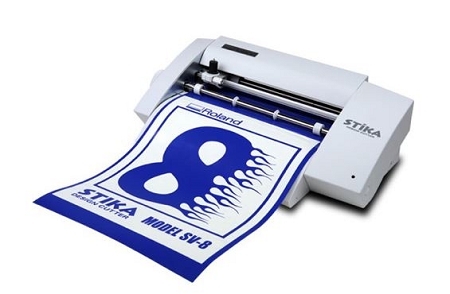 In addition to cutting vinyl and other materials, the new STIKA SV-8 makes an easy-to-use and cost-effective print/cut solution. This powerful design software lets you reduce, re-position, rotate, tile and mirrorimages. It enlarges images as crisp as original size and cuts TrueType fonts without outlining. CutStudio also supports BMP, JPG, STX, AI, and EPS file formats. CorelDraw and Adobe Illustrator plug-ins are included for Windows 98/SE/ME/2000/XP as well as an Adobe Illustrator plug-in for Mac OS9 and higher. Making professional-looking graphics is a snap with the STIKA. Simply design your graphics with bundled Roland CutStudio software, peel away the excess vinyl, and apply. Its that easy. You can even contour cut printed graphics using your desktop printer and the STIKA driver. Roland cutters have earned worldwide reputation for reliable performance and outstanding results. Today, like all Roland products, they come with an international ISO certification. This signals Rolands commitment to offering top quality products backed up with first-rate customer service and a wide variety of supplies and accessories.